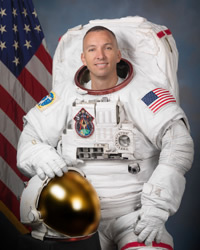 U.S. Marine Corps Lt. Col. Randy Bresnik, '89, is one of the six astronauts scheduled to take part in the STS-129 space shuttle Atlantis mission in November. Join with us as we countdown Atlantis. The crew of the space shuttle Atlantis will arrive at Kennedy Space Center today for launch training—big news for The Citadel whose tie to the STS-129 missionis with U.S. Marine Corps Lt. Col. Randy Bresnik, class of 1989, one of the six astronauts preparing for Nov. 12 liftoff. Bresnik, a member of Band Company, commissioned as a second lieutenant in the Marine Corps after graduation in 1989. As a Marine, he gained wide-ranging experience in complex aircraft, first by attending flight school and being selected to fly jets, then by attending TOPGUN and Test Pilot School, flying F/A-18s and various test aircraft and ultimately logging more than 4,500 hours in 79 different aircraft. As a part of the mission on the Atlantis, Bresnik and his crew will deliver two express logistics carriers to the International Space Station, take part in three spacewalks, and return NASA Astronaut Nicole Stott to Earth. 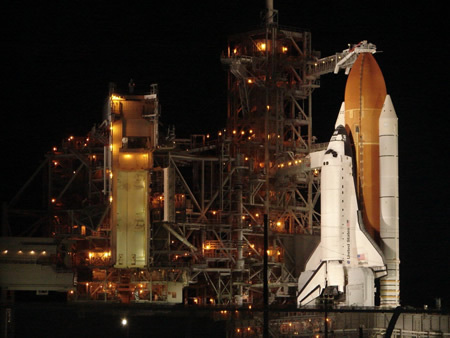 The launch of the space shuttle Atlantis has been rescheduled. NASA is aiming for Nov. 16 at 2:28 p.m. EST. Officials decided Monday to alter the launch date to streamline the launch of both the Ares I-X and Atlantis. The same launch team at Kennedy Space Center is supporting both the Atlantis and the flight test of the Ares I-X rocket, which is scheduled to lift off Oct. 27. The space shuttle Atlantis is on Launch Pad 39A being readied for liftoff. Oxidizers are being loaded in to the orbital maneuvering system (OMS) and reaction control system (RCS) tanks. Both the OMS and RCS are thruster systems used largely to maneuver the shuttle. The OMS engines slow the shuttle down before it enters the atmosphere for landing. Both systems use hypergolic propellants, chemicals that burn on their own when they come in contact with one another. Family: Bresnik and his wife Rebecca adopted a 2.5 year-old Ukranian boy last spring and are currently awaiting the birth of their second child who is slated to be born in November while Bresnik is aboard the space shuttle Atlantis. After being delayed a day for inclement weather, NASA’s Ares I-X test rocket lifted off from Kennedy Space Center successfully yesterday. Because both the Ares I-X and the Atlantis use the same support crew, the lift off of the Ares makes way for the launch of the Atlantis. Click here to see the test flight of the Ares. U.S. Marine Corps Lt. Col. Randy Bresnik (far right), class of 1989, along with the other 5 crew members of the STS-129 mission completed the Terminal Countdown Demonstration Test, known as TCDT, training yesterday. After the training they returned to Johnson Space Center in Houston where they will conduct final launch preparations before the launch at Kennedy Space Center on Nov. 16. While other members of the Regimental Band Class of 1989 are making their way to Charleston for Homecomingand their 20th reunion, Randy Bresnik is in Houston at Johnson Space Center’s motion base simulator practicing integrated entry procedures in preparation for the space shuttle launch in 10 days. This year the Regimental Band, which was founded in 1909, celebrates 100 years. As a cadet, Bresnik played the drums. With six days before liftoff, Randy Bresnik, ’89, (third from left) and the STS-129 mission astronauts have been quarantined in a germ-free environment at Johnson Space Center in Houston. The countdown to launch will begin at 1 p.m. Friday. While Bresnik is the first Citadel astronaut, the Military College has other ties to the space program, including Assistant Professor of Physics Luke Sollitt , who is part of a team exploring the shadowed regions of the moon in search of water. Harry Y. McSween, ’67 , is a geologist and an expert on meteorites, who has been playing a role in NASA spacecraft missions since 1997. The class of 1985 has two graduates, Stephen K. Odendahl, who is with NASA, and Brig. 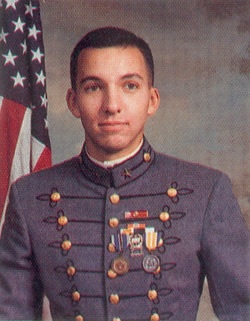 Gen. Christopher Pope, who is with the military space program. Beginning at 1 p.m. today, NASA’s official launch countdown clock will begin counting backward. The Nov. 16 liftoff of the Atlantis is scheduled for 2:28 p.m. and can be viewed on NASA TV. A tab for NASA TV is now on this website. Please note that you may be prompted to download Active X to access the webpage. Randy Bresnik, ’89, and other crew members of the STS-129 mission are currently at Kennedy Space Center engaged in prelaunch activities. Beginning Saturday, The Citadel Office of External Affairs will provide updates of the launch from Kennedy Space Center. At the 11 a.m. prelaunch press conference today, NASA Shuttle Launch Weather Officer Kathy Winters said that there is only a 10 percent chance of weather prohibiting the launch Monday of the space shuttle Atlantis. The STS-129 mission is currently slated to lift off from Launch Pad 39A at Kennedy Space Center on Monday at 2:28 p.m. The launch is the first for astronaut Randy Bresnik, ’89, a mission specialist who is one of the six crew members. The Atlantis will carry 30,000 pounds of hardware to the International Space Station. On Sunday morning at 6 a.m. Citadel photographer Russ Pace will accompany NASA personnel to a marsh near the launch pad where he will set up two cameras to be activated remotely at the time of liftoff. Later that day the shuttle’s protective Rotating Service Structure will be rolled away in preparation for the Monday launch. “Atlantis is ready to launch,” officials said at this morning’s prelaunch news conference at Kennedy Space Center. NASA Shuttle Launch Weather Officer Kathy Winters said the weather continues to be favorable for a Monday launch. The conditions for a delayed launch are not as favorable with a 30 percent chance for weather prohibiting the launch on Tuesday and a 60 percent chance on Wednesday. The seas are a little bumpy for the SRB recovery with swells predicted to be 7 to 9 feet. SRBs are the Solid Rocket Boosters—the rockets that provide the majority of the thrust for first two minutes of liftoff. The STS-129 mission flight, the first for Randy Bresnik, ’89, is scheduled to return to Kennedy on Nov. 27. The crew will conduct three spacewalks and return International Space Station crew member Nicole Stott to earth. With the rollback of the rotating service structure (RSS) this evening, the Atlantis is one step closer to liftoff tomorrow. Citadel Commandant of Cadets Leo Mercado arrived at Kennedy Space Center Sunday for the launch of the space shuttle Atlantis. Mercado, class of 1979, represents the college, alumni and The Citadel family for Randy Bresnik’s inaugural space flight. 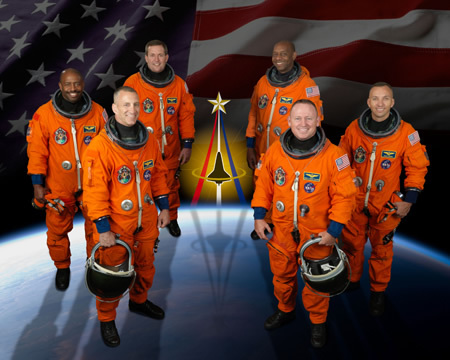 The six member crew of the STS-129 mission headed out at 10:40 a.m. today for the launch of the space shuttle Atlantis. The mission is Randy Bresnik’s inaugural spaceflight. Crew members are currently strapped in and performing communication checks. Air to ground communication checks with Houston Mission Control Center are next on the agenda followed by the hatch closure. NASA weather specialists continue to monitor weather. While in space Bresnik will miss Thanksgiving and the birth of his daughter who is expected to be born later this week. A noise has been detected in the hydrogen pump of the space shuttle Atlantis' fuel cell number 2, which is causing NASA officials concern. If serious, the issue could cause the mission to be scrubbed. Weather conditions are favorable for the 2:28 p.m. launch of the space shuttle Atlantis and Randy Bresnik's inaugural spaceflight. The fuel cell problem is now a non-issue. The hatch has been closed and latched, and NASA’s two recovery ships, the Liberty Star and the Freedom Star, are in position to recover the solid rocket boosters after they fall in the water. The excitement among the crowd surrounding the countdown clock was palpable in the last ten minutes before liftoff. Two unconcerned seagulls circled the spectators, and the American flag danced around as if anticipating the liftoff of the 4.5 million pound space shuttle. Atlantis blasted off among great billowing clouds of smoke, leaving a trail of exhaust clouds serpentining in its wake—its mission to deliver parts to the International Space Station and bring home station resident Nicole Stott to earth. But for the Military College of South Carolina, the mission signifies The Citadel’s foray into space exploration. Randy Bresnik, ’89, one of the six crew members onboard the space shuttle, was born Sept. 11, 1967, in Fort Knox, Ky. When he was two weeks old, his father, who was in the Army, drove the family to California. Just south of Malibu and a little north of Venice Beach in Santa Monica where there’s always an ocean breeze, Bresnik grew up riding his motorcycle along the Pacific Coast Highway and the canyons of Malibu. His grandfather was a photographer and photography became a hobby of Bresnik’s. In elementary school, he began playing the drums, a pastime that he continued through college. When it came time to go to college, Bresnik accepted a Marine Corps scholarship and moved 2,500 miles away to The Citadel, a place he first learned of through Pat Conroy’s book, “The Lords of Discipline.” He was prepared to push himself to the limits. As a cadet, Bresnik was a member of Band Company and Junior Sword Drill. He majored in mathematics and earned Gold Stars for academic excellence. As the Atlantis thundered away into orbit, it broke new ground for The Citadel. And from his vantage point in space, Bresnik has set his sights on another frontier, the International Space Station. Once again, he is pushing himself to the limits. At 11:51 a.m. today about 200 miles above the Earth between Australia and Tasmania, the space shuttle Atlantis docked at the International Space Station. Citadel graduate Randy Bresnik, ’89, one of the crew members on board the Atlantis, is due to become a father during the mission. His wife, Rebecca, was told she would never have a biological child, so the couple adopted a 2-year-old boy from the Ukraine last spring. Now Rebecca is expecting the birth of their daughter this week. Randy Bresnik, ’89, is getting ready to walk. 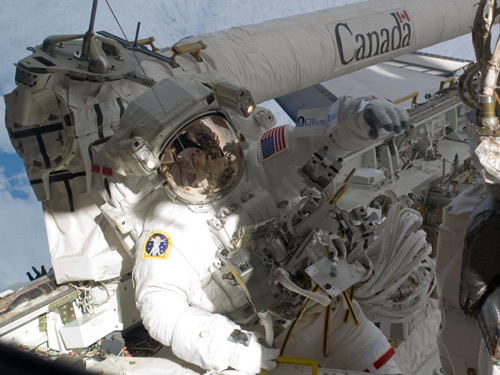 No tours for this former cadet—he’ll be conducting his first spacewalk also known as an EVA (extravehicular activity). The STS-129 Mission will be conducting three EVAs, the first of which took place today at 9:18 a.m. Bresnik will participate in the second and third EVAs which are scheduled for Saturday, Nov. 21, at 8:10 a.m. and Monday, Nov. 23, at 7:18 a.m. EST. The spacewalks can be viewed on NASA TV . All times are subject to change. Citadel graduate Randy Brenik, ’89, and the other five crew members aboard the space Atlantis arrived at the International Space Station this week, but what is the ISS and how does it affect life on earth? The ISS is a research facility that orbits the earth. The endeavor, which began in 1998 when the first two modules were launched and joined together in orbit, is the work of more than 100,000 people from 15 nations. The first crew arrived in 2000—one American astronaut and two Russian cosmonauts. Expedition 20 and 21 Flight Engineer Nicole Stott is the final astronaut scheduled to use a space shuttle for transportation to or from the ISS. Stott will return to Earth with the crew of the Atlantis. ISS crews have consumed 23,000 mealsand 20,000 snacks. Their favorite meals are shrimp cocktail, tortillas, barbecue beef brisket, breakfast sausage links, chicken fajitas, vegetable quiche, macaroni and cheese, candy-coated chocolates and cherry blueberry cobbler. And lemonade is the preferred beverage. The ISS has increased human understanding living in space which is critical for future space exploration, yet at the same time everything from the station’s construction to the experiments conducted onboard, the ISS is enhancing life on earth. Just one example of this is a plant-growth experiment without soil. In the sterile environment plants grew faster and disease-free with 90 percent less water leading to the development of a commercial aeroponic system. For more information on the International Space Station, check out NASA's ISS fact sheet. Houston, we have a baby! Abigail Mae Bresnik arrived on earth at 11:04 p.m. CST, Saturday, Nov. 21, in Houston, Tx. The new addition to the NASA family weighed in at 6 lbs, 13 oz. Bresnik, ’89, who conducted his first spacewalk on his daughter’s birthday, got the news Sunday morning by private phone patch through mission control. Bresnik later announced the good news to flight controllers and passed out cigars to the members of the STS-129 crew. At 8:24 a.m. EST today Bresnik began the third and final spacewalk of the mission. Randy Bresnik, '89, is pictured here on today's spacewalk, and he's wearing The Citadel on his sleeve. The spacewalk is the third and final of the STS-129 mission. The crews of the space shuttle Atlantis and the International Space Station bid farewell to one another and closed the hatches between them today as the STS-129 crew prepares to undock from the station tomorrow. Randy Bresnik, ’89, and his fellow crew members will spend their Thanksgiving Day in transit to earth. They are scheduled to land at Kennedy Space Center on November 27, which is expected to be an especially memorable homecoming for Bresnik who will meet his new daughter, Abigail Mae Bresnik, who was born Saturday. 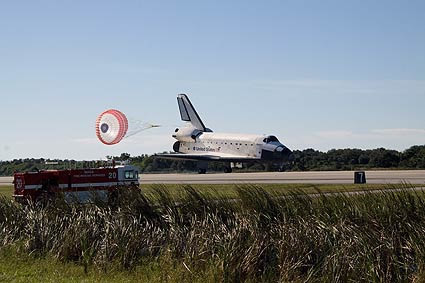 The space shuttle Atlantis landed at 9:44 a.m. EST today on runway 33 at Kennedy Space Center bringing home Randy Bresnik, ’89. The STS-129 mission was Bresnik’s inaugural spaceflight. During the 11-day assignment Bresnik took part in two of the three spacewalks and became a new father.